It can be a major challenge to orchestrate a Caribbean airport rendezvous for a family of six coming from four different cities, trying to all meet in St. Maarten airport within an hour, but I did it! Using a combination of on line airline booking, Wimco air department, and my own wits, I orchestrated Providence, Baltimore, Newark, and New York arrivals to land in Juliana Airport within the same hour...and they did. We had such fun buying one more Carib beer each time a new face showed up at Gate 9 (a Wimco tradition perpetuated by my 18 years traveling for the company...a Carib beer to toast in the tropical air on arrival). I've been to St. Barts plenty of times, usually on business when I am either traveling alone or with a bevy of my colleagues. When it is the bevy business, we get one of the bigger villas so we can all stay together, and it is very collegial and noisy and busy and fun, with marketing staff going in one direction and reservations staff going in others with their Sibarth pals. 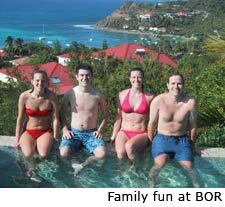 But this trip to St. Barts was private…down time with my own family. I wanted to relax, to laugh, to hang around with my grown children, to experiment in the kitchen with my two young chefs, to do nothing important and everything privately. It was not the first trip to St. Barts for my family, but a new son-in-law-to-be was joining us and experiencing the island with the eyes of a newcomer. 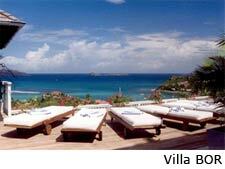 BOR was our villa on St. Barts for this trip, and what a fantastic, welcoming, graceful home it was. Brook Lacour had told me that this villa was a perfect Gordon family villa…just our style...so I had chosen it this year on her advice. I have a particularly sensitive eye for fabrics, color, and high end upholstery...BOR with its blue/white clean, crisp look and decor fit the bill. On arrival night we dined in the interior white dining room...it was the first and last time we used the interior spaces. It was not that they were unwelcoming or uncomfortable, it was just that they were inside and our souls were outside, even in the very breezy (defined by placemats that went flying unless anchored down by a full dinner plate) dining gazebo. By day two we learned to anchor everything outside suitably and to keep the flame going in the barbeque, so from then on all meals were al fresco, avec breezes. Other than the curiously designed and traffic-confounding road and turn up the hill by Kiki et Mo, the great thing about BOR and other villas on the St. Jean hillside is its proximity to "stuff". In spite of the challenging climb past Tropical Hotel and up the right hand turn onto an even steeper hill, the distance on foot up to the villas high on the hillside isn't long...it causes short, steep suffering on foot rather than a long drawn out one. 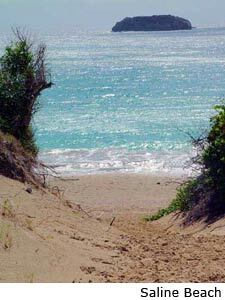 Being walkable, however, opens up a wide variety of independent escapades for the kids (my young adults are still kids in my mind) such as swimming at St. Jean, drinks at Nikki Beach, drinks at Eden Rock, drinks at La Plage, and drinks at Zanzibarth. Do you catch the drift here? It is very relaxing for a mom to know that her beer-drinking enfants terribles are not zipping around the hairpin turns and dangerous hills en voiture, but are rather trudging in penance back up the hill and sweating it off. 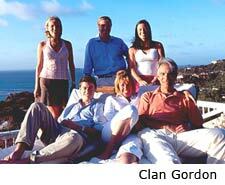 The proximity of the villa to places of interest also allowed a group of six to get along with two cars, not three. When we travel to St. Barts as a family we usually have to be careful of the calorie budget as well as the fiscal budget, for too much dining out at the island’s fabulous eateries takes its toll in multiple ways. Our pattern is to either do a big lunch out at a beach club or hotel all afternoon and stay in for dinner, or hang at our villa pool or the southern beaches all day and go out for a really fun dinner. Our favorite by far for lunch and lingering on the beach till late afternoon is La Case de l'Isle at the Hotel Ile de France, where beautiful Provencal blue linens and porch trim, market umbrellas, and divine seafood washed down with a lightly chilled Rose create an aura of contentment and satiation only matched by the sensual beauty of Flamands Beach. 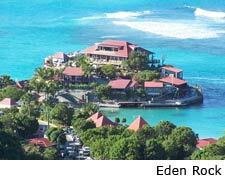 I just never want to go to St. Barts without lunch at the Ile de France! I even love parking between the palm trees in their teeny tiny spaces of the parking lot! The favorite night time treat for us is L'Esprit de Saline. To go up and over the ridge and down the other pastoral, stone walled, rural Saline side of the island in the pitch dark is fun...I always feel like I'm traveling far away to dinner. Then out of nowhere the floodlit escarpment of craggy rock overhanging L'Esprit de Saline pops into view, and laughter, new age music and clinking glass sounds come from the tented "camp" looking restaurant. The small but special nightly menu always offers some creative fusion surprises, and friendly servers explain with pride the nightly fare. L'Esprit de Saline is the kind of place where one lingers with good vibes, sensual music, great conversations, and no hurries. My son and son-in-law both love to cook, as do I. Part of villa life for us is cooking and "playing" in the kitchen. It is not a chore; it is recreation and bonding. So we went to Match, we went to AMC, we went to La Rotisserie, and we went to the new fish market near the boules courts on the harbor entrance, and we cooked...we barbequed...we sliced and diced...we had a soupcon of this and a soupcon of that. Luckily, my son had brought his new Ipod, so music was constant and customized for cooking (or for the cooks). It seems like we made endless trips to Match, but who complains when that is part of the fun of it all? There's one more tradition that isn't a lunch favorite and isn't a dinner choice: Le Select. All of us seem to return trip after trip after trip to the festive, jovial, run-into-whomever kind of experience that defines having an afternoon Carib at Le Select. The kids seemed to use it as the planning center from which they'd find out where to go that evening for "late night." 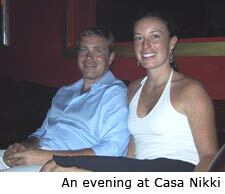 I don't know that I always got the real story of where they ended up, but often it was Casa Nikki in town, which is allowed to stay open far later than Nikki Beach and seemed to be the scene for the young and hip crowd. Well, this Trip Report is winding up, but stay tuned for my daughter's upcoming St. Barts honeymoon report that follows this summer's wedding in Newport. They promise to write from the romantic honeymooner perspective, and something tells me it will have a different slant than the family of six spring break kind of report!